Disclaimer: Everything you see here is at-your-own-risk. If this doesn’t work for you, or it ends up bricking your phone, etc., it’s your own damn fault. Sorry. All I can say is that it worked great for me. You’ll need to download all of these files before you get started. If figuring out how to download these things proves to be too hard for you to figure out, then you should not be attempting this project. You probably don’t understand enough of the basics, and will make a mistake that will likely brick your device. 1. BACK UP EVERYTHING FIRST! Use Titanium Backup to back up all of your data and apps. Use ClockworkMod ROM Manager to back up your current ROM. You’ll need to do this first, before you start the following steps. Hook up your phone using your USB cable and use “mass storage mode” to copy the zip file over. 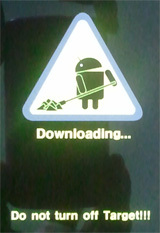 Throughout this process, you’ll need to keep putting your phone into “download mode.” You’ll know you’re in download mode because the phone will display a screen with a big yellow triangle with the Android robot holding a shovel, and the word “Downloading…” underneath it, and the words “Do not turn of Target!! !” at the bottom of the screen. 1. Disconnect the USB cable, remove your battery. 3. Connect the USB cable. 4. Press and hold the volume up and volume down buttons. If you’ve done this right, you should be in download mode. I’m not thrilled with the Heimdall frontend, so I just use the command-line interface using Terminal.app. Stop now. Go back, figure out what you did wrong. You cannot proceed until Heimdall can see your phone connected via USB and in download mode. After the device reboots, you should have a working Captivate running stock Gingerbread ROM. From here, follow the usual steps to get into ClockworkMod Recovery, and install the Cognition5-v2.zip update that we copied onto the internal SD earlier in step #3. If all goes well, you should be able to reboot your phone after the update and be up and running on Cognition 5 v2! If I’ve made a mistake in any of the steps, or have left out important details, feel free to help correct them by leaving a comment below.